The R-3 Rudder Zinc Anode is hand poured using special high grade 99.995% zinc ignots, which ensures a higher quality zinc anode. Save big on the best R-3 3-11/16" Rudder Zinc Anode available. All Zimar Zinc Anodes are made in the U.S.A, and meet all standards set forth by Mil-Spec A-18001K, Mil-Spec A-18001A, and Mil-Spec A-18001. 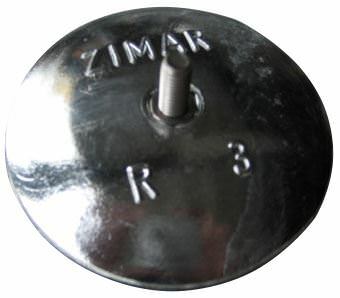 Huge fan of Zimar zincs - best zinc anodes out there. Amazing how great Zimar zinc anodes perform, considering how low priced they are. Will only use Zimar zincs here. Purchased an r-3 rudder zinc anode here. Excellent service, great product at a good price. This is my fourth year ordering zinc for my boats. Ordering online was easy, no human beings involved at all. Prices were very competitive. Quality of zincs is superb. Fast delivery. Could not ask for more. will definitely be back.